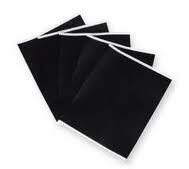 Retro Educational Technology: Carbon Paper is Cool! When you enter our incredibly high tech offices, you'll find a typewriter ready to use right in the reception area. It's the same typewriter that I used through high school (I graduated from BCC in 1976) and my Dad wrote his doctoral thesis on (awarded in 1962). Astute observers will notice that I've put in three pieces of paper and that there's a piece of carbon paper between the top two. The reason for three sheets of paper is that my Dad taught me that it would protect the carriage and keep it from breaking. The reason for the carbon paper is to properly recreate the way I typed my papers. Photocopies were rare and expensive back then so we used carbon paper. To my delight, I bought the carbon paper right at Office Depot. Apparently, it's still in use. Despite that, when I show it to the kids, they think carbon paper is really cool. Of course, it takes them awhile to understand it's purpose but once they do, they think it's fun and want to make a huge mess with it. BTW, who is Kevin Laurence and why would I mention him in a post about carbon paper? Is he the inventor of carbon paper? No, he is not. Sadly, we don't know for sure who the inventor of carbon paper is but thanks to Kevin, I know this about the origins of carbon paper. And I quote from Kevin's The Exciting History of Carbon Paper! The exact origin of carbon paper is somewhat uncertain. The first documented use of the term "carbonated paper" was in 1806, when an Englishman, named Ralph Wedgwood, issued a patent for his "Stylographic Writer." However, Pellegrino Turri had invented a typewriting machine in Italy by at least 1808, and since "black paper" was essential for the operation of his machine, he must have perfected his form of carbon paper at virtually the same time as Wedgwood, if not before (Adler, 1973). By 1823 Cyrus P. Dakin of Concord, Massachusetts, was making carbon paper similar to Wedgwood's, and selling it exclusively to the Associated Press. Forty-eight years later, the same Associated Press was covering the balloon ascent of Lebbeus H. Rogers; a promotional stunt in Cincinnati for the biscuit and grocery firm of which Rogers had just been made a partner. During an interview in the newspaper offices after the flight, Rogers happened to see Dakin's carbon paper and immediately saw its commercial potential for the copying of office documents. The firm of L.H. Rogers & Co. was immediately founded in New York, and in 1870 achieved its first major sale ($1,500) to the United States War Department (Sheridan, 1991). However, it was not until 1872 and the development of a practical typewriter for commercial office use (the Sholes and Glidden typewriter), that Rogers' vision was proven correct. Oh yeah--great photos and fabulous trip down memory lane! I still use a filmstrip projector in my classroom! The kids see it on the shelf and think it's a camera, as in surveillance! HA! Have you ever heard of a Cyclo-teacher? It was a product from World Book encyclopedia. As a kid, I learned my math facts and all the presidents this way. Great learning aid!